On December 13 1990, Blond Ambition World Tour Live was released exclusively on laserdisc by Pioneer Artists. It featured the final tour date, recorded on August 5th in Nice, France, which had been previously broadcast live on HBO. 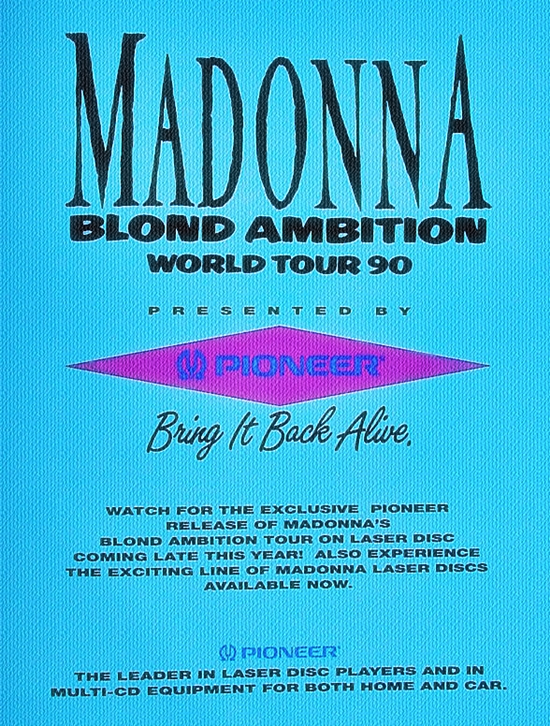 The release was part of a special arrangement with Blond Ambition Tour sponsors Pioneer Artists as a means of promoting their struggling laserdisc format. The laserdisc went on to win a Grammy for Best Music Video – Long Form at the 34th Grammy Awards, which is notable for being Madonna’s first-ever Grammy win. With the eventual demise of the laserdisc format, this landmark tour has never received a proper release on DVD or Blu-ray. Although widely bootlegged (in varying degrees of quality), it is currently unavailable to purchase in its entirety in any official form, much to the disappointment and frustration of fans. A 2012 Blu-ray release of the accompanying tour documentary Truth or Dare – which features a select number of performances from the tour filmed in stunning technicolour during her shows in Paris – failed to offer up any additional performances not already included within the documentary (a previous VHS release of Truth or Dare had included bonus performances of Hanky Panky and Like A Prayer). Meanwhile, seemingly remastered audio/video footage of the Nice show mysteriously turned up on YouTube in 2013, along with the caption “Master submitted to Reliance Mediaworks in 2011. Full digital remaster, error correction, frame by frame color grading (RELM.NS) DTS-HD master audio from original stems (Nasdaq:DTSI).” The user uploading the footage appears to have created a YouTube account for the sole purpose of streaming the tour and does not reply to comments requesting further information on the source of the footage, making it difficult to ascertain its legitimacy. While there are noticeable signs of improvement in the audio mix, the video quality is inconsistent, with some shots showing improved colour grading and others appearing excessively dark and overly filtered. Whether the quality issues are the result of a highly compressed upload file or if they are evidence of its possible inauthenticity as an officially commissioned remaster are a matter of speculation. Incidentally, Reliance MediaWorks’ parent company, Indian conglomorate Reliance ADA Group, is the major shareholder of IM Global, which provided financial backing and acquired international distribution rights for Madonna’s film W.E. in 2011. Blonde Ambition also was a triumph but in all actuality she wants to leave it in the past! I would love to see Blonde Ambition on DVD but in all honesty, Madonna is moving on and forward with her life! So I do think she has some regrets-but then, Madonna’s not Sorry, it’s Human Nature! Nobody’s Perfect-Not me, not Madonna, not even God! Even God has His Faults even on the best days!